AQUAGOLD Fine touch IS THE WORLD'S ONE AND ONLY MICRO-CHANNEL SKIN NEEDLING DEVICE with patented technology using 24ct gold plated needles each thinner than a human hair. Your skin is unique, Aquagold Fine Touch allows total personalisation of your treatment, our skin specialists create a bespoke cocktail of ingredients to target your individual skin concerns and goals. 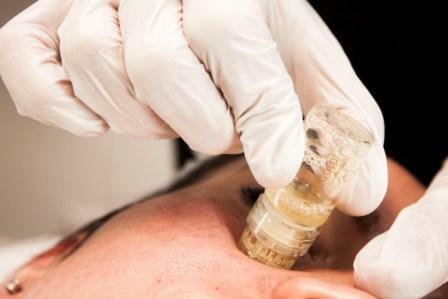 The device is designed to painlessly and effectively deliver Micro-Botox, Hyaluronic Acid, Vitamins and bio-active compounds deep into the skin. AQUAGOLD Fine Touch, known as the Golden Cocktail Facial by Hollywood’s elite, tightens, plumps and brightens the skin, it improves texture, tone, pigmentation, melasma lines, inflammation, redness, pores and even acne scarring. Visit our Harley Street, London clinic for a full consultation. AQUAGOLD Fine Touch is a patented gold-plated, needle system that delivers custom solutions into the skin at the ideal 600 micron depth. It allows us to painlessly and effectively deliver vitamins, stem cells, nano-peptide active ingredients, micro-botox and fillers. It works on the principle of delivering active cosmeceutical ingredients into the mesoderm, the middle layer of the skin, penetrating the skin’s protective outer layer to ensure effective delivery of all ingredients. This results in improving the quality and structure of the skin and enhancing cell regeneration at a deeper level. The skin is left fresher and more radiant, while avoiding common complications or risks associated with traditional mesotherapy or injectable techniques, that can often be painful, require downtime and even cause skin irritation. The treatment is then complimented with an LED Light Therapy Facial to reduce redness, boost collagen renewal and calm the skin. 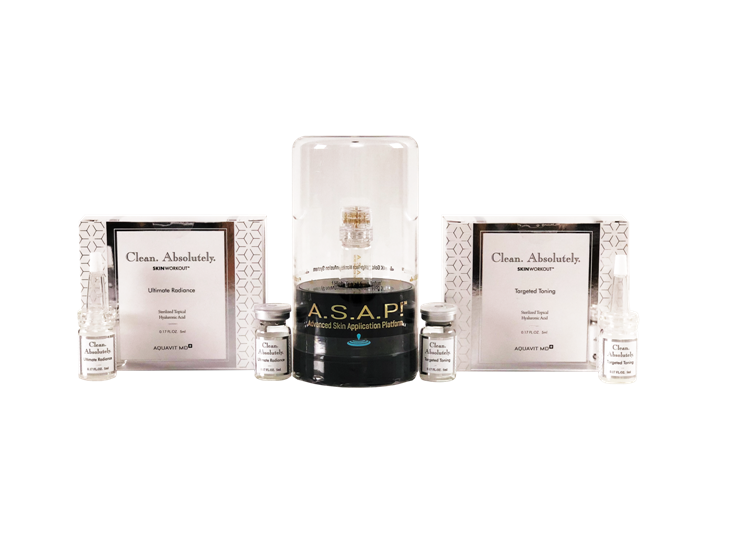 Patients can now purchase the A.S.A.P!™ Micro Infusion System - The high-tech home use applicator dramatically accelerates absorption of specially developed SKINWORKOUT™ serums, ideal for use in between in-clinic Aquagold Fine Touch treatments. Ultimate Radiance Serum - A high-performance serum with the purest Hyaluronic Acid, PDRN and growth factors. A rejuvenating blend that treats signs of aging and helps to regenerate damaged skin. What are the advantages AQUAGOLD® fine touch delivery system? 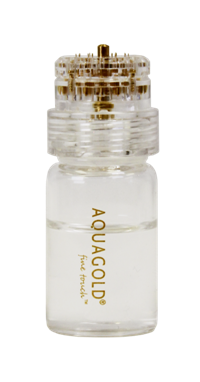 AQUAGOLD® fine touchTM has the proven ability to deliver the desired amount of highly active cosmeceutical ingredience just under the dermis, at a consistent depth enhancing cell regeneration at a deeper level and the skin will become fresher and more radiant. Will I have a reaction? Unlike micro-needling or mesotherapy this provides even coverage delivered with 24ct gold plated needles, which means you will have no bumps, bleeding, dryness or breakouts following treatment, just some mild redness. The gold material prevents skin reactions. How many micro-needles are there? How is AQUAGOLD® Fine Touch different from other micro-needle devices? The purpose of AQUAGOLD® fine touchTM is to micro channel and deliver treatments directly to the skin. The purpose of other common micro needle devices is to puncture the skin for stimulation. Why are the AQUAGOLD® Fine Touch needles gold-plated stainless steel? The surgical grade stainless steel provides the structural integrity of the micro-needle. Pure gold has high bio compatibility with human skin, preventing irritation and allergic responses after use. Impurities and other metals may result in unnecessary irritation. How does AQUAGOLD work with Micro-Botox? The AQUAGOLD device can deliver small amounts of botox below the skin surface. In this more dilute and superficial dose, botox works differently and functions more specifically on the upper layers of the skin for a softer and more natural look. The result is that skin appears smoother, with improved skin tone and pore size. 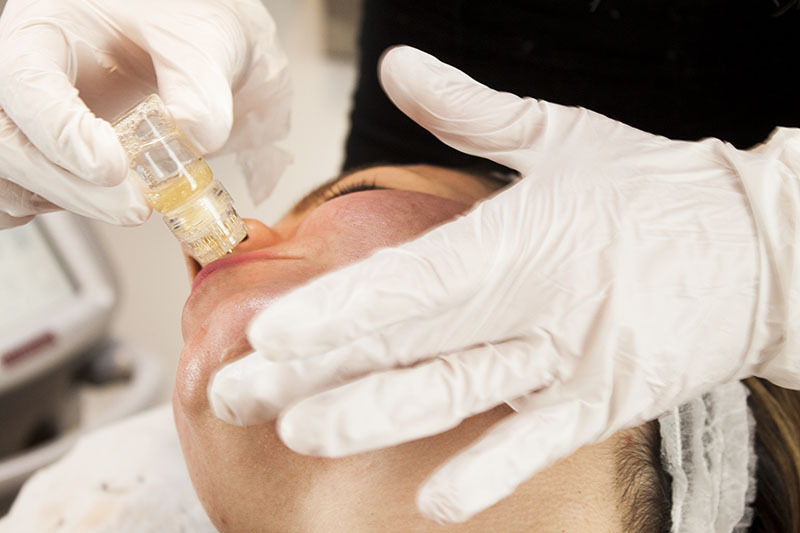 How does AQUAGOLD work with Hyaluronic fillers? Hyaluronic Acid is what makes up the extracellular space between the body's cells. It is a the primary ingredient in most facial fillers and in many medical grade skin care products. HA can be delivered using microchannel mesotherapy to plump and hydrate the skin, giving the skin a hydrated, plumped and healthy glow. The Aquagold Golden Cocktail Facial can be a one off ‘pre party’ treatment (12-24 hours before an event) or used as a monthly maintenance routine. For even more enhanced results use as part of combination therapy with laser, chemical peels or even HIFU treatments. There is no downtime following the AQUAGOLD Fine Touch treatment, just some mild redness. We advise not to wear make up for a few hours after treatment. Price: AQUAGOLD Golden Cocktail facial with LED Light Therapy HEALITE II.